Today is the school reopening day for my younger son Arjun and he looked absolutely amazing in his new school uniform and new backpacks and polished shoes. He showed such maturity for a child who is stepping into I std by getting up early n the morning and getting ready all by himself. He was quite enthusiastic to meet his old friends. I really feel sad and guilty that I have not been able to take my kids anywhere during this summer vacation as both myself and my DH were very busy with our work schedules. All the books and notebooks were covered already and I am glad that I did not give in to laziness and leave it till the last time. So to salve my guilty conscience I asked him what he wanted to take to school for lunch though I know what would be his answer. As expected pat came his reply as vegetable biriyani. He simply loves the one pot meals and especially the veg biriyani. I am really glad that he has asked for it as I have not made it since their vacations started and that means not in two months time. Boy! That was a long gap and I really wanted to please him and feel happy on his first day at school. So this is what I made. I normally don’t like using basmati rice for making biriyanis. So I use seeraga samba for mixed rices as they don’t become soggy even if use excess water by mistake. So wash the rice well and soak them in water. Cut the vegetables to finger length pieces. Cut the onions into juliennes. Chop the tomatoes. Wash the mint and coriander leaves and chop them. In a pressure cooker heat the oil and ghee, add all the whole spices and sauté them till they turn a light brown and u smell the nice flavors of them. Add the onions and sauté till they turn slightly brown. Now add the ginger garlic paste, green chilli and the tomatoes and sauté till the tomatoes goes mushy. Now add the turmeric, coriander and chilli powder and fry till the raw smell disappears. Now add the cut vegetables, mint leaves and sauté them for 5 minutes till the masalas coat them well. 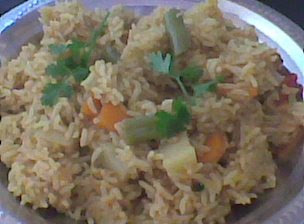 Remove any excess water from the rice and add the rice to the vegetable mixture and mix well. Pour 3 cups water and add the garam masala powder and salt. Close the lid and cokk for 2 whistles. Remove pressure immediately and squeeze in the lemon juice and mix lightly without breaking the rice. Garnish with coriander leaves before serving. Veg briyani is ready. Nothing goes well with this biriyani as thaiyir pachadi. Thaiyir as u know means curd or yoghurt and dahi in hindi. 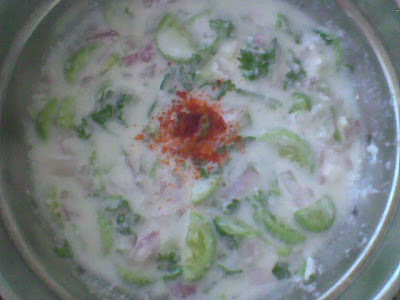 Pachadi means salad or raitha. Cut the cucumber into small pieces. Cut the onions into juliennes. Chop the tomatoes. In a mixing bowl pour the curd and lightly beat it. 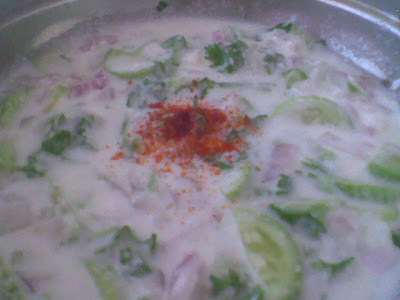 To this add the cut cucumbers, onions, tomatoes, coriander leaves, salt and mix well. Refrigerate till u serve and before serving sprinkle the chat masala over the salad. Cool thaiyir pachadi is ready to serve. This also goes as my entry to siri’s frozen yoghurt event which I think is a cool idea to beat the heat.